Medium - $73.99 Large - $73.99 Only 4 left! Looks like the circus is coming to town! Are you ready to give your friends nightmares this Halloween? Well, let's be honest, nobody is really afraid of vampires and werewolves anymore. You’ve got to take something sweet from their childhood and twist into something terrifying. 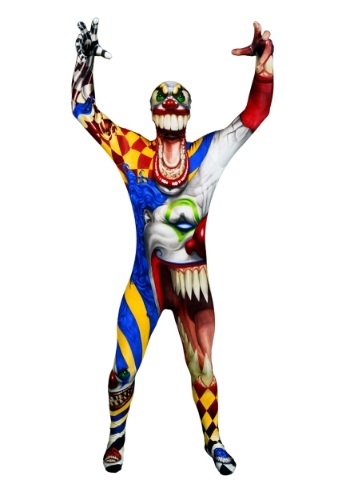 Take this Adult The Clown Morphsuit for example. Everyone remembers the lovable clowns that made them laugh with their circus antics. Now you can make them forget those fond memories and be a horrifying monstrosity that makes everyone scream! This officially licensed Morphsuit is perfect for a quick and easy Halloween costume. There’s no need for any extra accessories with this haunting bodysuit. Nope, simply work on your maniacal clown laugh and you’ll surely steal many hours of sleep from your peers this year. So many other costumes require way too much work to pull off a scary transformation, but once you slip this bad boy on, your transformation is complete! Just don’t look in a mirror or you may end up with nightmares too.